New Jersey Commissioner of Education David Hespe has announced that the New Jersey Department of Education will commit $200,000 in seed money to Future Ready Schools – New Jersey, a program designed to promote digital learning in the state’s public schools. 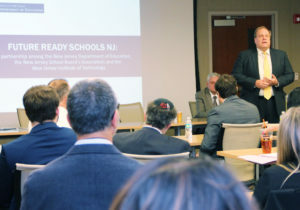 Hespe made the announcement during an April 14 “kickoff” meeting hosted by the New Jersey School Boards Association, a partner in the initiative with the NJDOE and the New Jersey Institute of Technology. More than 30 industry leaders also attended the session at NJSBA headquarters in Trenton. The new program will provide guidance to educators and assistance to schools in securing technology. Future Ready Schools – New Jersey will also recognize schools and school districts for best practices in digital learning. It will be based at the New Jersey Institute of Technology, with NJIT staff helping to develop the program. Future Ready Schools – New Jersey will be structured similarly to the successful Sustainable Jersey for Schools program, which leads to certification of schools and districts that adopt environmentally and financially sustainable practices. In the 18 months since Sustainable Jersey for Schools was launched, 437 schools have joined the program. Future Ready Schools – New Jersey will be officially launched at the New Jersey School Boards Association’s annual conference, Workshop 2016, in October. The first schools and districts are expected to obtain certification in 2017.